Green Planet Carpet Care is a family operated Glendale, Arizona carpet cleaning company that services the entire Phoenix, Arizona metropolitan area. We Get Your Carpets Cleaner - Guaranteed! 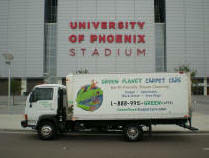 Green Planet Carpet Care is a locally owned and family operated carpet cleaning company located in Glendale AZ. We offer both residential carpet cleaning and commercial carpet cleaning services for the entire Phoenix, Arizona Metro Area. All of our carpet cleaning technicians are IICRC certified on cleaning procedures which are endorsed by the largest carpet mills and manufacturers. Our carpet cleaners are well-trained in avoiding the three most common causes of carpet damage: over-wetting, use of harsh cleaning detergents, and prolonged drying. Green Planet Carpet Care is unlike the low cost carpet cleaning companies who will quote you a bargain basement price over the telephone then when they arrive at your house or business they will ask you if you want pre-spray or other items to increase the cost. These items are included in any price we quote, there are no hidden costs for pre spotting or vacuuming. If you want your carpets the cleanest they can be, INSIST on the BIG CARPET CLEANING TRUCK.